What stands out, if we’re thinking in broad strokes, when I consider what helps Brian K. Vaughan’s body of work separate itself from the crowd in an industry that seems to unveil new talent every week, is that for starters, his concepts are simple, and almost laughably so. Saga is about the child of two lovers from opposite sides of an ongoing war, and how their little family tries to find somewhere safe and peaceful. Y: The Last Man is even simpler; what if a disease wiped out every mammal with a Y chromosome, except for one young man and his monkey? These concepts work beautifully as long-running narratives. The characters are either fleeing from something or searching for something, which keeps them and the story moving. Thus, it opens up new and exciting opportunities as Vaughan expands the worlds he invests in. 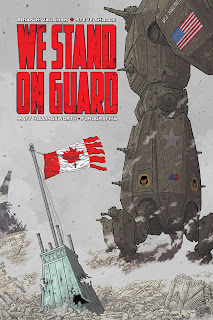 We Stand on Guard is an anomaly amidst Vaughan’s recent wave of books, including the two aforementioned titles as well as Paper Girls and, before all that, Ex Machina. Vaughan’s aptitude at crafting engaging narratives from simple beginnings, and his ability to sustain quality, is his hallmark. We Stand on Guard proves that he can write a six-issue miniseries that hits on multiple levels. This particular book’s flaws, ironically, come down to the simple fact that some elements might have worked better were this an ongoing series. We’re introduced to our protagonist, Amber, as a child, and each issue starts similarly; we spend some brief time with her and her brother, whom she’s lost between then and the present day. We believe that her brother has a part to play in the narrative, which takes place years later, because his absence has weighed heavily on our main character. In the end, he does very little. When we meet him, it feels more like fodder for readers. He interacts with a prominent character in a concentration camp, and his is the emotional reaction we cling to at the book’s finale, but he plays no role in the narrative whatsoever. Were he a reoccurring element, in another universe where this book runs for twelve, fifteen, or more issues, then it may have built towards a satisfying culmination for both him and his sister. But I’m getting ahead of myself here. We Stand On Guard follows the hostile takeover of Canada by the United States, and we pick up in a time where all that remains are freedom fighters doing what little they can while America salvages resources from Canadian marks on the map. Vaughan is as always quick and to the point in building his world. He does this so efficiently that we buy it from the beginning. Unfortunately, his protagonist remains a blank slate for the entire remainder of the book. It turns into an ensemble, a reasonably well handled one, but its hero is only ever a hero and nothing more. She fights because it’s the right thing to do. There’s a clear villain in all this (though that becomes less black and white, I’m happy to say), and so why wouldn’t she fight? We’re shown that she’s suffered, and the life she’s led leaves little time to develop a personality outside of her survival mode. Vaughan packs the story with his trademark zaniness, too, as well as his penchant for playful, at times jaw-dropping, dialogue. Every interaction is a joy. Steve Skroce’s artwork fits the book sublimely, offering a more rough-around-the-edges finish compared to Vaughan’s other collaborators, and he adds so much detail to everything from the environments to the mechanical robots the team comes up against. The colors, by Matt Hollingsworth, are often a wintery, gorgeous blue as our characters trek through mountain and forest, making for a unique and pleasant visual experience, but Skroce finds plenty of time for the grotesque and shocking too; within the open pages, we see our protagonist’s father on the edge of death after a horrific missile strike leaves his body in more parts than it started. We Stand on Guard is not Vaughan's best. If anything, it’s a satisfying book to fill the time between trades on his two other ongoing Image series. It tries to engage in too much with too little time, as though Vaughan envisioned this as an ongoing series initially, and the characters suffer because the plot allows little time for anything else. If Saga is space opera and Paper Girls is sci-fi drama, then We Stand on Guard is Vaughan’s blockbuster. There’s some food for thought here, but mostly you’re getting some enjoyable action and witty dialogue packed into an engaging narrative, albeit one we’ve seen time and again in recent years. When it comes to value for your dollar, Vaughan is a safe bet. We Stand on Guard is safe enough, and Vaughan never fails to add plenty of layers to his stories, but it perhaps falls short of the quality we’ve now come to expect.